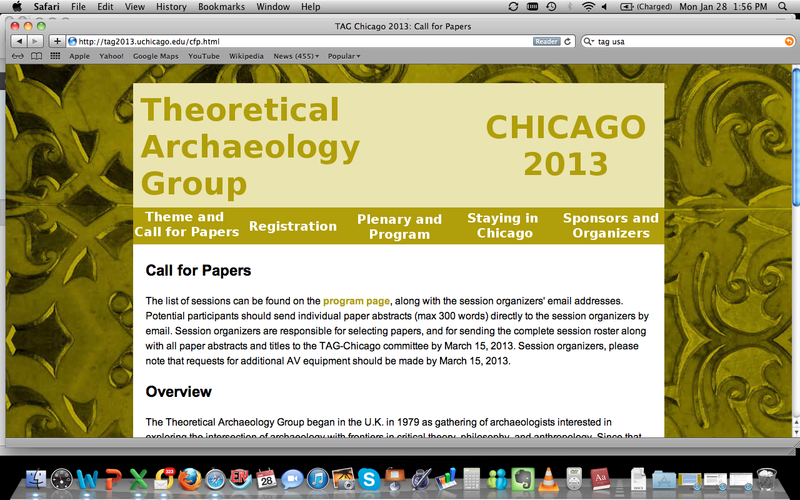 Just a very quick post to advertise the session that the wonderful Cat Cooper and I are organising at the Theoretical Archaeology Group USA conference in Chicago – 9 – 11 May 2013. The Call for Papers is below. We hope you’ll consider contributing to it or forwarding details to your interested colleagues. Screenshot of TAG USA 2013 conference homepage. Hope you can join us! We are in the unique situation of being able to stream the session through 4 sites: from Chicago itself, from the University of Victoria (Canada), from the University of Southampton (UK), and from the University of York (UK); so there are various intercontinental options for where to join the session. This means we welcome papers from anyone who is interested in participating remotely from one of these sites. Deadline for submission of abstracts to Cat & myself is 1 March 2013. Don’t hesitate to contact us with queries. Research tends to begin with a series of observations on a site, object, monument or related space as it stands in the present, and leads to the construction of narratives which aim to craft a dialogue between that experience of the real today and the experience of the real in the recent and distant past. Visualisation is a critical methodology in such narrative creation—extending far beyond mere presentation of results into the actual constitution of data and the working and reworking of archaeological ideas. It is a key player, then, in the process of mediating the real. The visual tools we use (both new and old), their interactions with our ways of seeing, and the relationships between these interactions and our experiences on-the-ground — with collaborators, spaces, and other sensory engagements — affect how we do archaeology and conceive of the past. In other words, visual practices are intimately connected to different ways of thinking, and such connections can be (and have long been) exploited to productive effect. This session seeks to explore such ideas via a session linked across two continents, broadcast online in the form of a series of ten minute papers followed by roundtable discussion. The discussion will be accessible to participants in Chicago, Victoria (Canada), and in the UK at both the University of York and University of Southampton. We welcome short papers introducing different methods of visualisation (including illustration, photography, survey, creative media or computer graphics) or different modes of collaborating visually. Our intention is to nurture a discussion around how vision and imaging impact upon archaeological knowledge creation, shaping our research and the future of our practice. Many thanks for your interest and attention! 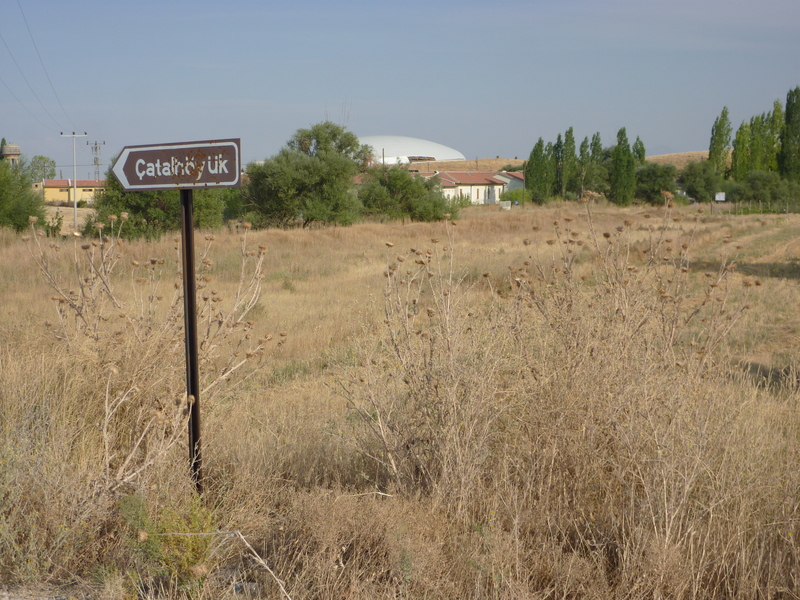 On the road to Çatalhöyük. Photo by me in August 2009. Along with the rest of the Southampton team, I’m preparing to depart for the incredible site of Çatalhöyük where we’ll be working for the next few weeks on various visualisation-related projects. Çatalhöyük is awe-inspiring—both in terms of the archaeology itself and the logistics of the massive fieldwork operation—and, with its 50-year excavation history, it stands as a perfect forum for exploring the construction and evolution of disciplinary visual traditions. Such exploration has long been nurtured at the site, meaning that we have the advantage of c. 15 years of critical thinking about the subject to draw upon. This is quite unique, I believe, in the discipline, especially as it has often been pushed forward (or otherwise enabled) by site illustrators themselves (e.g. Swogger 2000). Tessa Leibhammer (2000, 2001) and, more recently, Colleen Morgan have begun to probe the historical trajectories of illustrative and photographic work at the site, and Colleen has assembled some great databases of Çatalhöyük visual materials to allow others to do the same. These projects are complemented by a series of other digital, multi-sensory and museological experiments at/on the site (e.g., Ashley 2004, Morgan 2009, Tringham n.d.), and by the current graphic outputs of artists like Kathryn Killackey and Çatalhöyük’s photographer Jason Quinlan. In tandem with the local communities of the region, and the site’s long-standing community archaeology team, Southampton is now building upon such work. You can learn more about us on our university website, here, and read about our previous field season in the Çatalhöyük 2009 Archive Report, here. Immediately following our return from the field, I’ll be off to the EAAs. I’ll post again in September when I’ll be preparing for the 3rd Visualisation in Archaeology workshop (21-22 Oct), and the start of my work on the Sorrell archive at the Society of Antiquaries. Bye for now! Ashley, Michael (2004) An archaeology of vision: Seeing past and present at Çatalhöyük, Turkey. Unpublished PhD thesis, University of California, Berkeley, USA. Leibhammer, Nessa (2000) Rendering realities. In Towards Reflexive Method in Archaeology: The Example at Çatalhöyük. I. Hodder, ed. Pp. 129-142. Cambridge: McDonald Institute for Archaeological Research. Leibhammer, Nessa (2001) Rendering ‘realities’: Towards a reflexive understanding of pictographic images from the archaeology site at Çatalhöyük, Turkey. Unpublished MA thesis, University of the Witwatersrand, Johannesburg. Morgan, Colleen L. (2009) (Re)Building Çatalhöyük: Changing virtual reality in archaeology. Archaeologies: Journal of the World Archaeological Congress 5(3):468-487. Swogger, John-Gordon (2000) Image and interpretation: The tyranny of representation? In Towards Reflexive Method in Archaeology: The Example at Çatalhöyük. I. Hodder, ed. Pp. 143-152. Cambridge: McDonald Institute for Archaeological Research.